Showing results for tags 'asparagus'. Well it seems like spring has finally arrived in the UK ! My visit to the local weekly market provided me with 2 of me absolute favourite things - Monkish tails and English Asparagus (the Asparagus season here is very short, but the Asparagus is superb....) So the Monkfish got chunked and marinated for a couple of hours in a simple combination of EVO, Lemon juice, fresh Oregano and Parsley, and some salt and pepper. The Asparagus was steamed in lightly salted water for about 3 minutes then refreshed in cold water. Then dressed with EVO. The monkish got skewered and then on to the Monolith: Cooked over direct (but not too fierce heat), brushing with the remaining marinade until nicely cooked and the Asparagus had picked up a little charring: Using the type of wide skewers that sit on racks prevent any chance of the fish sticking to the grill and possibly breaking up and is my preferred method of cooking this type of fish. Served with a fresh mixed salad and some fries. It was absolutely fantastic. If you are fortunate enough to have superb fresh ingredients like these you really don't have mess with them much !!! It was a hot one today in Low Cal with the temperature reaching 104 in the shade on my patio. Not my favorite weather to be grilling but I had thawed out this beautiful 2.5” ribeye I had in my freezer so I just had to cook it. Rubbed it down with some Primo Chicago Stockyard rub and wrapped it up for a rest. While it was resting I prepped my Corn and asparagus. Once my kamado was up to 225 I put on the ribeye As I waited for it to reach an IT of 113 degrees I added the corn and asparagus. After 4 minutes I took the asparagus out and placed it on for some direct grilling. After approximately 6 minutes and a flip or 2 they were done. I took them off and placed them back into the foil and took them inside. By this time the ribeye was at the 113 that I wanted. I took it off and loosely covered with foil. I opened up the vents for searing. Once it was up to 650 I put the steak back on. After 3 minutes I flipped it and heard the sizzle. Love this shot. After another 3 minutes I took it off and covered it again and took it inside for a 10 minute rest. Here it is after the rest. and now sliced up. Here is everything plated up with a Sierra Nevada Torpedo Extra IPA. Yum! Thanks for looking. Dinner tonight was smoked meat loaf, with smoked mac & cheese and prosciutto wrapped asparagus, all cooked on the kamado. I started up the Vision, and added a few chunks of cherry wood: and brought it up to temp: While the Vision was coming to temperature I cooked the bacon for the mac & cheese, and sauteed the onions, green pepper, and garlic for the meat loaf: As I boiled the macaroni, I put the meatloaf on the grill: And finished the mac & cheese: At this point it was still too early to put the mac & cheese on the Kamado, so I made the wrapped asparagus. Each slice of prosciutto was coated with a thin layer of cream cheese, and then I wrapped the asparagus with a diagonal orientation to increase the coverage of the prosciutto over the asparagus: At this point I added the mac & cheese to the kamado: And after 45 minutes took them off, cooked to perfection! Then on went the asparagus: and off after about 12 minutes... And *** finally *** plated up a pretty good meal! Remember when I made the Petite Filet Mignon Oscar? http://www.kamadoguru.com/topic/26970-petite-filet-mignon-oscar/ Well my wife doesn’t really like steak and definitely doesn’t like anything from the sea. So I made something special for her to enjoy instead of steak. Here are most of the ingredients for this cook. I placed the boneless / skinless breast between two sheets of plastic wrap and pounded them with my 10” CI skillet to around 5/8” thick. I then dredged them in some flour mixed with 1 tsp. ea. of cayenne and white pepper and 1/2 tsp. of turmeric. I took that same 10” CI skillet and fried them up in some butter and oil. (It takes a shorter time because they are thinner) In the meantime you’ll remember I was grilling up the asparagus. Chicken is done. Here it is plated up on a bed of asparagus, approximately ½ cup of Hollandaise sauce and a Modern Times Oneida Hoppy Sessionable Pale Ale. And the ultra-close-up view. As it was her dish I didn’t get a fork shot. I did taste it and it was also delicious. That’s for looking. Anybody who has eaten at a Ruth’s Chris Steakhouse has probably seen this dish served to someone. If you haven here is a Yelp pic that shows what it looks like. Well it’s delicious and tonight I tried to recreate it here at home. Most of the ingredients are shown here: Sorry but lot of these ingredients were for a Hollandaise Sauce that I made but due to the rushed nature of this cook I didn’t take any pics of that process. (I’ll post something at a later time) I start out by prepping the asparagus by spraying them with a little OO and some fresh ground garlic sea salt and black pepper. I put this on my kamado direct for around 2 minutes per side. I then moved them up to the top indirect rack to the right. I prepped the Filet by spraying it with a little OO and the grinding on some fresh ground garlic sea salt and black pepper. And then on the grill for 3 minutes per side. I now put it on a serving platter and placed that on the top indirect rack to finish cooking and heat up the plate. (Something like what Ruth’s Chris does) After around 5 minutes I placed on 3 stocks of asparagus and approximately 1/2 cup of lump crab meat and cooked for another 4 to 5 minutes. (Sorry for the blurry pic) I brought this in and poured on approximately 1/2 cup of the Hollandaise sauce, some parsley flakes and a pinch of Cayenne chili powder. I then folded up a towel to set the plate on so I wouldn’t burn our new table. Here are the plated pictures with a Modern Times Oneida Hoppy Sessionable Pale Ale. Money shot! And the required fork shots! Sooo Delicious!!!! Easy Grilled asparagus recipes for both naked and bacon wrapped styles. Ingredients: asparagus olive oil salt/pepper OR lemon pepper bacon (optional) Directions: Break off tough end of each asparagus stalk by bending it in half. Coat with oil. Sprinkle/toss with spices. Optionally wrap in bacon slices. Grill either indirectly or directly until done. If wrapped in bacon, cook directly. My "I've Got a Bone to Pick" challenge entry. Spatchcock Turkey with New Potatoes and Asparagus. Injected the bird with Cajun Injector Creole Butter and rubbed it down with olive oil and Kentucky Poultry Seasoning. Put her on old smokey, indirect at 375 with some apple wood chips. Pulled the bird at 158 in the breast, after about an hour and a half. Threw some par-boiled new potatoes and asparagus in a cast iron skillet with some olive oil, granulated garlic, sea salt and oregano to get a little smoke while the bird rested. Plated pics of breast and quarter. And the Plated Money Shot. Thanks for looking. Happy Thanksgiving! So having few prosciutto slices left from my pork wellington cook, I copied someone on here and wrapped them with my asparagus. Chicken was seasoned with some black pepper, adobo and minced garlic for about 2 hrs. It was a quick meal and very delicious. I cooked it on direct heat (375ish) with few chunks of mesquite I soaked over nite. Prosciutto gave it a nice flavor. Tonight's dinner: Atlantic salmon on a cedar plank with grilled asparagus and flesh fried potatoes. I make these plank out of scrap material at my job, about 1/4" thick, I soak em for at least an hour before grilling. salmon is seasoned with Adobo, dried parsley, fresh ground black pepper, and dash of Hungarian spicy paprika. Potatoes are cooked to tenderness and sauteed. My beloved spouse staged an intervention, she said I was spending too much time fixing Kamados, and not enough time cooking on them. She was right. Today, a complex cook across three Kamados is underway. On the menu: Cornish game hen, stuffed with red/white/black rice, quinoa, bell peppers, mushrooms, black forest ham and onions. External rub is my standard poultry rub. Kamado used: Primo Oval Junior, set for 325. Pretzel style rolls were made. This involves boiling the dough in baking soda to get the chewy character in the crust. I failed to catch them at the right part of the rise, but the flavor is quite good. Kamado used: Kamado K7, set for 350 Seasoned potato slices with truffle oil was prepared as well. Kamada used: Kamado k7, set for 350. Mock Sous Vide Asparagus was seasoned, tightly wrapped in foil, and cooked at a low temperature to approximate sous vide Asparagus. This should allow me to get the tenderness and firmness which is hard to achieve through any other method. Kamdo used: Kamado Joe Big Joe, set for 225. The final completion of this cook is Crème Brulee, prepared in a way which has never been published anywhere. Classical crème brulee is cooked in a water bath, which provides a stable/low temperature to bake in. The key thing to know is, the custard is "done" when it's core is 175 to 185 degrees. I realized with good temperature control, and a low temperature cook, Hot spots could be avoided, and a uniform temperature could be achieved throughout the entire custard. To this end, ceramic baking plates were put in (no water bath was used), and the Brulee was cooked at 225. The brulee was pulled at a core temperature of 185, then put in the fridge for final set. Kamado used: Kamado Joe Big Joe, set to 225. Kicking off my 30 Days of Grilling a day early with some fancy-shmancy food. Mostly I was wandering around Whole Foods looking for something to throw on the grill and saw that lobster tails were $6.99 each. So I snagged 2 of them, a NY Strip for H, and a filet for me. Got the grill up to 400 to cook the usual Sunday chicken drumsticks (more about those tomorrow) and threw on a couple of potatoes to bake. I let the temps get away from me a little and the outsides of the potatoes were burnt, so no eating the skin, but the insides were perfect. Then I put on a pan of mushrooms tossed in garlic and olive oil: The two lobster tails and the asparagus: When the tails and the asparagus came off, I splashed a little red wine into the 'shrooms: Doused the lobster and the asparagus with herbed butter and capers (totally inspired by @jackjumper101's cook): Opened up the grill to get it up to a little under 600° and threw on the steaks. H's strip was on and off before I could blink. My thick filet took a little longer - long enough to get a photo: About 2 mins on each side and then off to rest and plate up: It was absolutely perfect! And now I'm stuffed and not sure I'll have room for pie. I grilled up some Choice NY Strips last night and they turned out pretty good. I reverse seared the 1.5 in thick strips and grilled the asparagus after marinating in balsamic vinegar and soy. I used a modified APL four seasons rub (I add a little italian seasoning instead of using the basting herbs) on the steak. Grilled the steaks indirect @ 225 til internal of 110 then fired it up to 550+ to sear them. Took them off at 130 for a nice medium steak. Butterflied the Pork Roast and added some crumbled feta and spinach that I had cooked in olive oil and strained. The Asparagus was marinated in soy and balsamic vinegar and the board dressing is Italian seasoning with olive oil and garlic. So I did another Tri-Tip today. I was going to have asparagus and baked potatoes but we didn’t have any sour cream so we settled for roasted potatoes. Decided to mix it up a bit and try a new marinade recipe for the Tri-Tip that I saw on another site. I lightly coated with light olive oil, then balsamic vinegar, coarse ground sea salt with garlic and finally coarse ground black pepper. Wrapped and rested 2 hours. 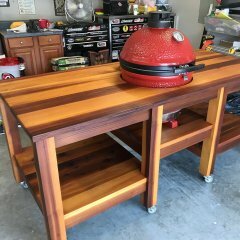 Set up my kamado for direct / in-direct. Put the asparagus on some skewers. I sprayed them with olive oil, then coated with coarse ground sea salt & garlic and coarse ground black pepper. Put the Tri-Tip and potatoes on the grill. (40 min. at 300, flipping once) After this I took it off, wrapped it in foil and opened the vents wide open to do some searing. (Had earlier put on a chicken breast for my wife) While it was heating up I switch grill grates. I put the Tri-Tip on the lower grate for searing and the asparagus on the top grate. (If you look carefully you can see the Tri-Tip searing under the asparagus) Here it is after searing. Wrapped it up to rest 15 minutes. Picked out a very tasty porter to have with dinner. After 15 minutes sliced it up. And here are the money shots. This is what I call a most excellent meal although I like my original way of cooking the Tri-Tip better than this way.